What is the Cape Coral Rose Garden Area? In the southern-most area of Southwest Cape Coral is the Rose Garden neighborhood, bordering the Tarpon Point development, the Westin Resort at Tarpon Point, and Cape Coral’s Rotary Park. The Rose Garden is on of our favorite Southwest Cape Coral neighborhoods: it’s an established neighborhood with beautiful homes and lush landscaping. Consisting primarily of single family homes, the Rose Garden is an established single-family waterfront neighborhood with many Gulf Access and Direct Access (no bridges) home sites — a great location for boaters. 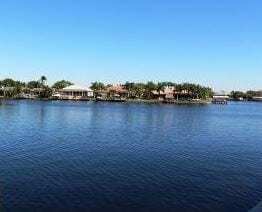 Wide canals and basins are a key attraction for Cape Coral home buyers in this neighborhood, along with the beautifully maintained and landscaped homes. Offwater homes in this Cape Coral community are also popular due to proximity to Tarpon Point dining and shopping, public festivities and events such as car and boat shows or fishing tournaments at the Tarpon Point Marina. Just across the street are the wonderful walking trails, butterfly garden, and dog park at Rotary Park.